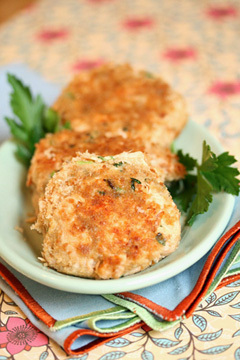 Serve salmon cakes on top of a lightly dressed mesclun or baby spinach salad. Sprinkle fresh chopped chives and enjoy as an alfresco lunch or the start to an elegant meal. Fish lovers will be hooked on this tasty preparation. A great way to use up leftover white wine and extra fresh herbs, these cakes also freeze beautifully. To poach the salmon, pour the wine into a large stockpot. Add the peppercorns, bay leaf, and juice. Add enough water to the wine mixture to completely cover the salmon filet. Bring the wine mixture to a boil. Turn off the heat and add the salmon. Allow to rest covered, 10-12 minutes, until the salmon filet is no longer translucent in the center and the skin softens. In a large bowl, combine mayo, scallions, parsley, mustard, and one cup of the breadcrumbs, salt, pepper. Remove the skin from the salmon and flake it into the bowl. Gently fold all the ingredients together with a spatula until the mixture comes together in a sticky but firm mass. Shape the salmon mixture into 8 patties. Place remaining breadcrumbs on a plate or piece of wax paper. Coat the patties in breadcrumbs and place on another piece of wax paper. If not using immediately, the patties can be chilled up to 5 hours. Heat a large skillet over medium-high heat and add oil. Cook patties on both sides until golden brown about 5-6 minutes total. Decrease the heat if the breadcrumb coating begins to brown too quickly. Sprinkle with chives and serve warm with tartar sauce or lemon wedges.